On View from October 13 through November 17, 2010 at Gallery 151. Gallery 151 is excited to announce the re-opening of its 350 Bowery location with a solo exhibition of contemporary New York artist John Platt. 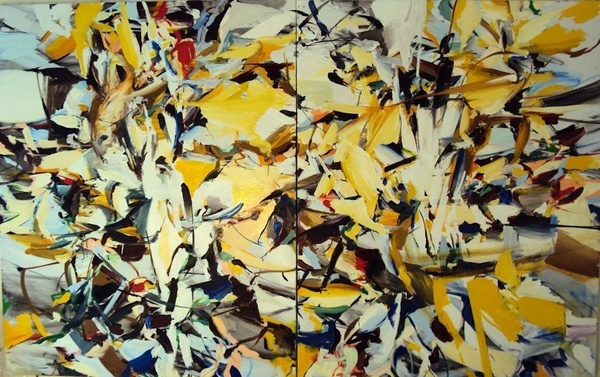 The exhibition entitled “DOWNTOWN 2010” showcases Platt’s 2010 works that use color and gesture through his unique lens of abstract expressionism. Platt creates visual drama while using color to create emotional content and without representational imagery the viewer is forced to react viscerally. The mediation between organic and mechanical forms is a constant theme in Platt’s work. There is a struggle between the wild, irrational fluidity of paint and the artists struggle to maintain and control it.